Fantasy Eatery (銀星小廚) has been around for many many years. I remember going with my family to its original Scarborough location at Midland and Finch when I was still in elementary school. To this day I still remember how we had to wait so long for a table! Fantasy Eatery was a very popular place back then because of the lack of competition for good and cheap Cantonese style food. 3) Served dishes with good "wok hay" (鑊氣). 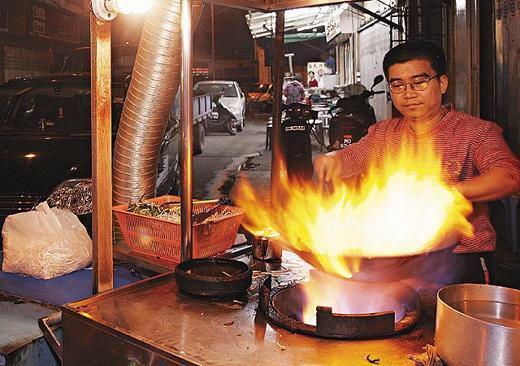 "Wok hay", literally translated as "breath of the wok", is essentially that elusive flavor that comes from cooking on a properly hot, seasoned wok. This is a wok so hot that flames erupt from it the moment the first morsel is introduced to the steel. There are probably other restaurants in Toronto that satsify those 3 criterias but because I live in Mississauga and do not frequent Cantonese style restaurants, my sources are limited. So please feel to suggest any others that you know of (for example, I know Magic Wok and King of Kings are supposed to be good too but I haven't been to either one). Moving on, the four of us ended up at Fantasy Eatery's second, newer Richmond Hill location at Times Square. I've never been to this location so I was a bit nervous about whether the food would be good. My worries quickly dissipated when I went in and saw that the place was packed, just like the good old days at the Scarborough location. We waited for half an hour to 45 minutes for a table. These 5 dishes were more than enough to fill our 4 hungry stomachs - we were all very satisfied with the food. My absolute favorite was the short ribs; it was crispy and and full flavor due to the barbeque sauce and garlic. My second favorite would be the stir-fry clams with its pungent black beans and spicy red chilies. My third favorite was a tie between the green beans and the taro duck - the green beans was the best example of what good "wok hay" is supposed to be, while the taro duck was more of a unique dish that not every Cantonese style restaurant offers on their menu. I did not care for the ox tail at all - my Mom makes way better ox tail. I would definitely go back to Fantasy Eatery whenever I want tasty and economical Chinese food. I mean, 90% of the dishes on their never-ending menu is less than $8, so it's really easy to go "crazy" and over order, especially if you go when you're extremely hungry. Gimme that KFC Double Down!